As marketers, we’ve all been guilty of sending mass marketing messages to prospects and customers. And yet, we know that the more personalized and targeted our campaign are, the better they perform. 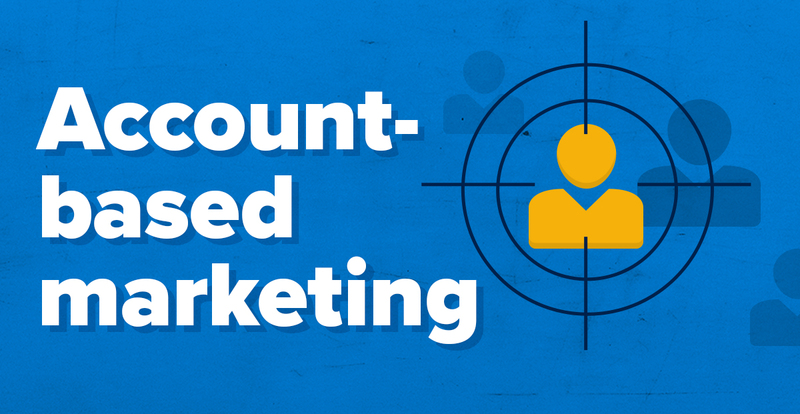 One way to become more targeted is to use account-based marketing. Not only will it help you become more targeted in who you market your product to, but it’s widely regarded as the best performing marketing channel. Backed up by more than 30 account-based marketing statistics, we’ll explain what it is and how your business can benefit from it. Plus, we’re sharing 5 practical tips so you can get started and immediately launch your first campaign. Whether intentional or unintentional, it’s a mistake that the majority of marketers make. We push out generic messages in the hope that they resonate with a small percentage of an audience that will eventually go on to make a purchase and become customers. Sure, some of us have created buyer personas and sometimes we even personalize our communication, but the vast majority of us still use the spray and pray marketing approach. One message to a global audience. Not everyone is a right fit for your product. If you sell your product or service to a customer who isn’t the right fit, it won’t take long before they realize this and leave. So, why would you invest sales and marketing resources into selling a product to a customer who will leave within a short space of time? Instead, your efforts should be focused on attracting, nurturing and selling to prospects that are the right fit for your products. And by ‘focused’, I mean laser-focused. Highly targeted sales and marketing campaigns that are tailor-made for specific businesses. It’s one message to one specific audience. And this is where account-based marketing comes in. 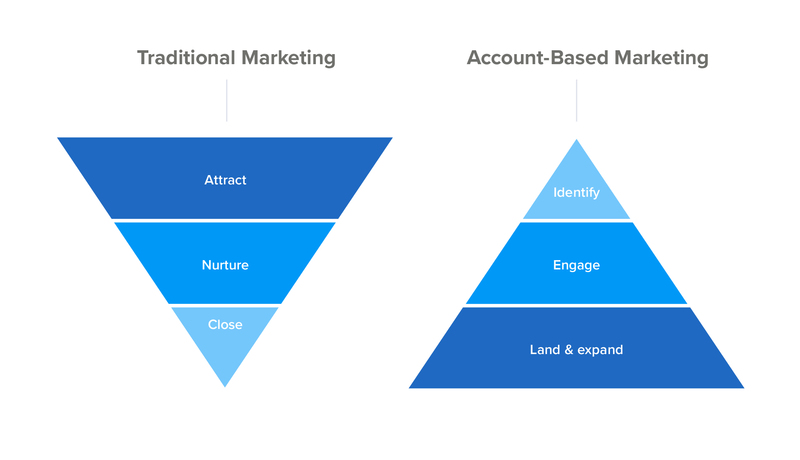 Account-based marketing (ABM) is a strategic approach to sales and marketing that uses highly targeted and personalized communication to win new business from a specific company (or an account). Rather than launching a broad marketing campaign that attracts thousands in an attempt to nurture only the few that express their interest, ABM targets specific companies in a bid to engage with key decision makers and then build on that relationship to open up new sales opportunities in the future (also known as “land and expand”). Put simply, account-based marketing takes the traditional marketing funnel and flips it upside down! Although account-based marketing has been used as a strategy for more than 15 years, (the concept was pioneered by ITSMA in 2004), it’s only now that businesses are starting to realize the potential for delivering highly personalized and relevant campaigns to their target audience. Which explains why in a study from SiriusDecisons, 92% of B2B marketers cite ABM as extremely important to their overall marketing efforts. 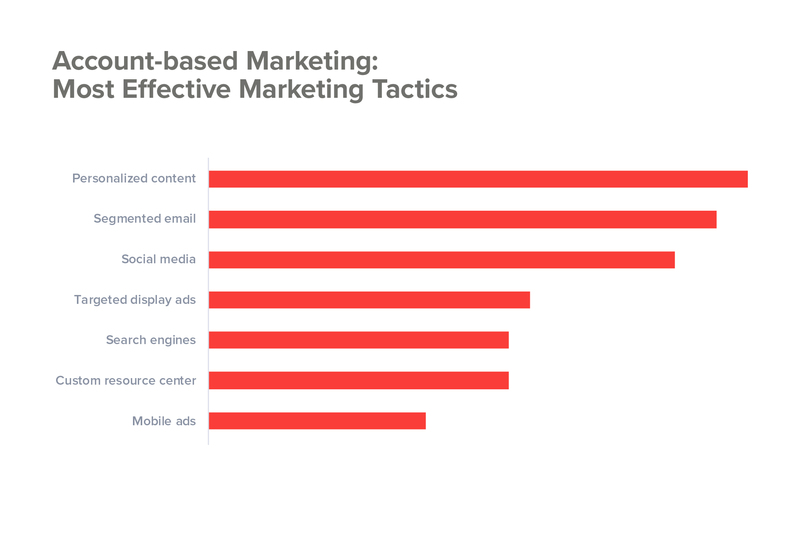 In fact, account-based marketing is of such importance that developing an ABM strategy is the second biggest priority for B2B tech marketers, just behind video marketing. But, where is all this hype coming from? Let’s find out. What are the key benefits of ABM? Anytime you consider investing in a new marketing strategy, you (or someone higher up) need to be convinced that it’s right for your business. But even if it is, you still need to sell the idea internally. 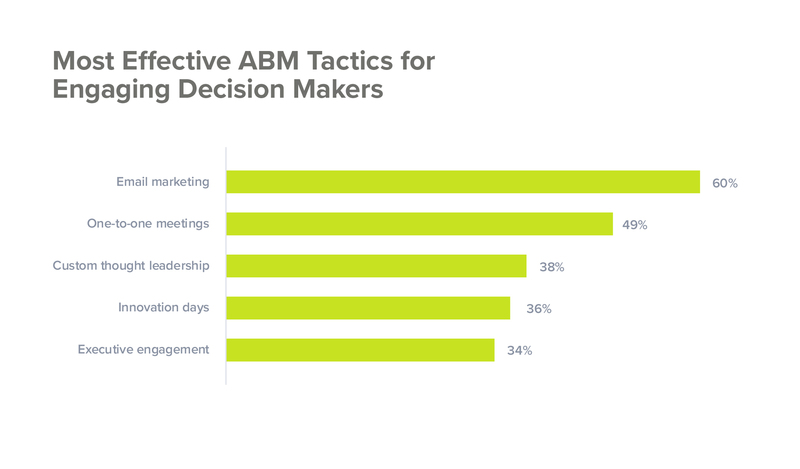 With ABM, 1 in 5 marketers say that their biggest challenge is getting buy-in from the top management. What can your business gain from implementing an ABM strategy? Based on the account-based marketing statistics that I have researched, I’ve found that companies who successfully implement an ABM strategy enjoy closer alignment between sales and marketing, higher return on marketing investment and increased revenues. Let’s take a closer look each at the core business benefits. Companies that align their sales and marketing activities generate higher revenue, enhance brand awareness and increase average deal size. In terms of strategies that align both teams, there’s none better than account-based marketing! For decades, marketers teams have been creating marketing campaigns to attract new leads for sales reps to sift through the noise, only to find a handful of leads that might actually buy. With ABM, the goal is to close a single account, which means both teams stay focused and work towards the same business goal. When a new lead from your target account comes in, it’s the same lead that both teams are chasing. Therefore, sales reps spend more time on nurturing a qualified, targeted lead – instead of wasting time following up on unqualified leads. 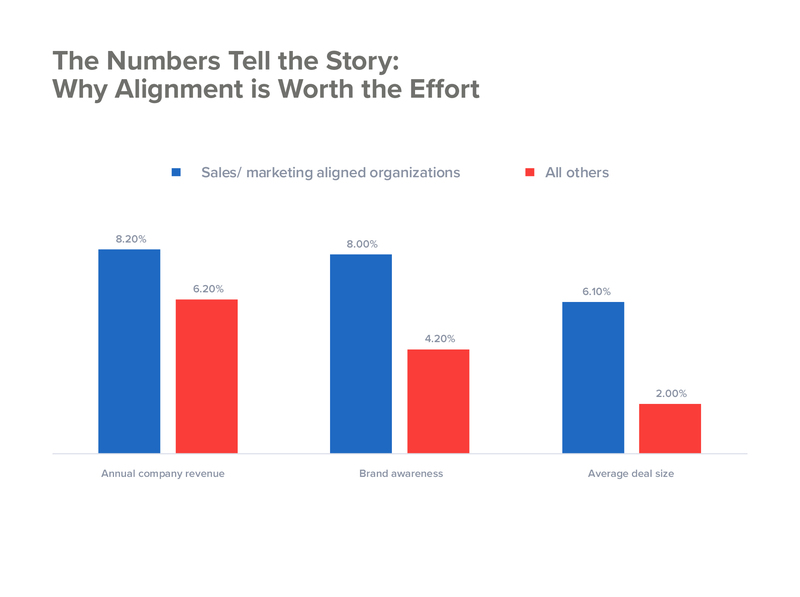 In fact, it’s so effective that 80% of marketers with an ABM program in place say they are “somewhat to tightly” aligned with sales. Tracking the Return on Investment (ROI) is important for every part of your business, but it’s even more important for the marketing department, which is usually seen as a cost center. So, when we spend our hard-earned marketing dollars, it’s important to show a positive ROI, right? For ROI enthusiasts (aka the CFOs), the good news is that the top marketing channel for generating a positive ROI is account-based marketing. 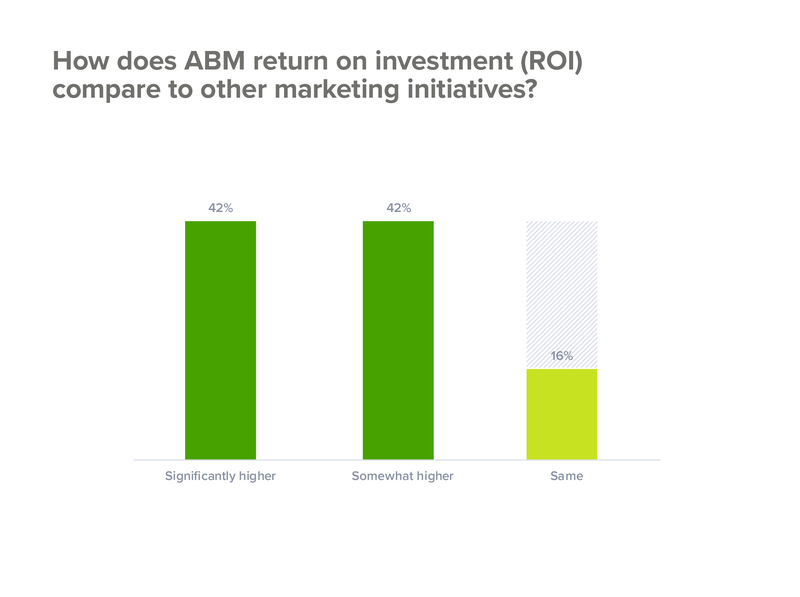 Research by ITSMA found that 87% of marketers that measure ROI say that ABM outperforms every other marketing investment! ITSMA also found that the investment you make in ABM delivers either the same ROI, somewhat higher or significantly higher returns compared to other marketing initiatives – making it a zero-waste strategy! It’s these kinds of results that have led to more companies focusing on ABM initiatives. And that’s exactly why ABM works – it helps you focus. When sales and marketing teams are aligned and focused on the same target account, they put more resources into engaging with the a B2B buyer and less on activities that do not move the buyer from one stage to another. Instead of spending $100,000 on a generic branding campaign across several markets, you create smaller, more specific campaigns towards a single account and its key decision makers. As you’re targeting fewer people, you end up spending less. But each dollar from the marketing campaign budget is spent on putting your brand in front of the right people at the right account. Ask any CMO: “What is the goal of any new marketing initiative?” And they will answer that it is to increase revenue. And what is a better way to increase revenue than through ABM? Not only does ABM help align sales and marketing teams and generate a positive ROI, but it’s also been proven to increase revenue. Incredibly, 60% of companies that use ABM saw a revenue increase of at least 10% within 12 months, while 1 in 5 companies experienced a revenue increase of 30% or more. The answer lies in average deal size. In a study by SiriusDecisions, 91% of companies using ABM were able to increase their average deal size, with 25% of respondents stating the increase being over 50% or larger! 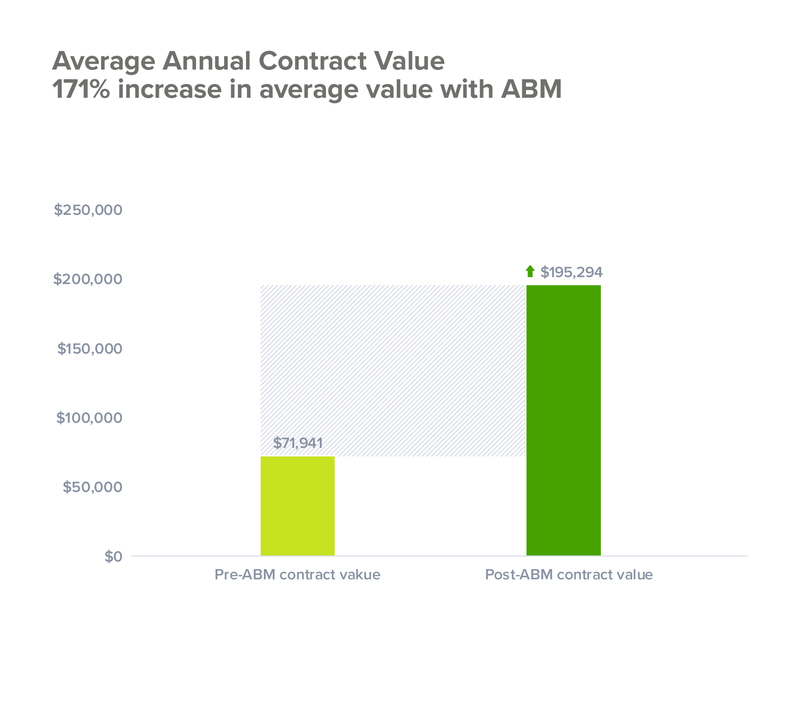 This is further backed up ABM Leadership Alliance, who found through their own research that B2B marketers saw an increase in average annual contract value of 171% after implementing their ABM strategy. Of course, increasing your average deal size is not something that happens overnight. It begins by re-evaluating who your ideal target customer is and who you want to sell to. Using a CRM, weed out the smaller (micro) customers that you’ve acquired recently and learn more about the customers that have a high average deal size. Take what you learned from selling to them and then find similar companies to target. Given your past success, it’s these types of companies that are more likely to do business with you and thus, increase your average deal size overtime. We’ve outlined what ABM is and how your business can benefit from it. But even though it’s cited as a top marketing priority, 30% of marketers are not using account-based marketing today. So, let’s take a look at how you can get started and launch your first ABM campaign. Account-based marketing is about tailoring campaigns to specific accounts, so the first thing you need to do as part of your campaign is to identify a list of key accounts. 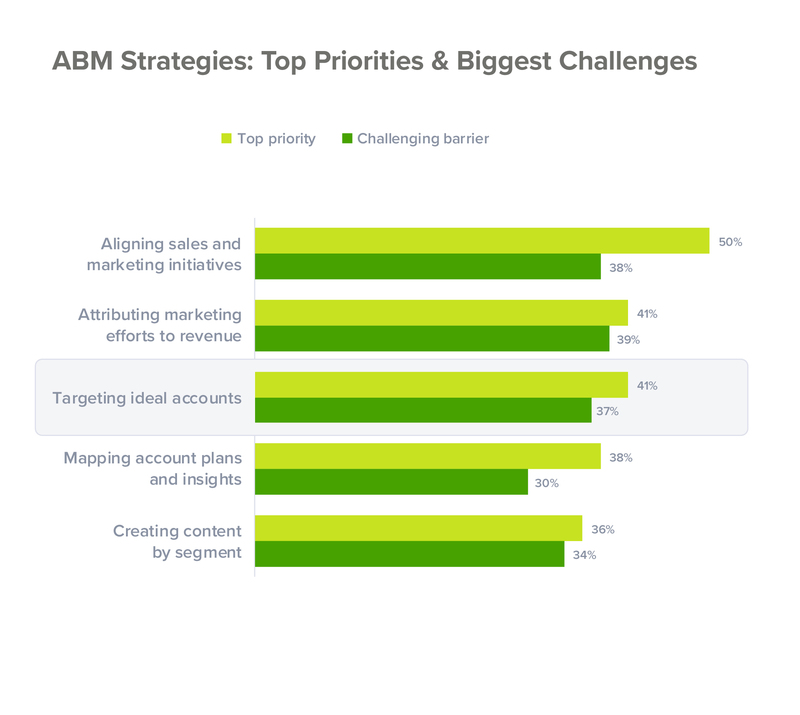 Well, that’s the first hurdle many B2B marketers come across as targeting ideal accounts is cited as a top 3 ABM challenge. The easiest way to target ideal accounts is to ask your sales teams which accounts they would like to close. But, that’s mostly down to guess work and it’s not very data-driven. Instead, start with your existing customer data. Finding companies that match your ideal target customer helps you narrow down your focus as to what type of company will do business with you in the future. 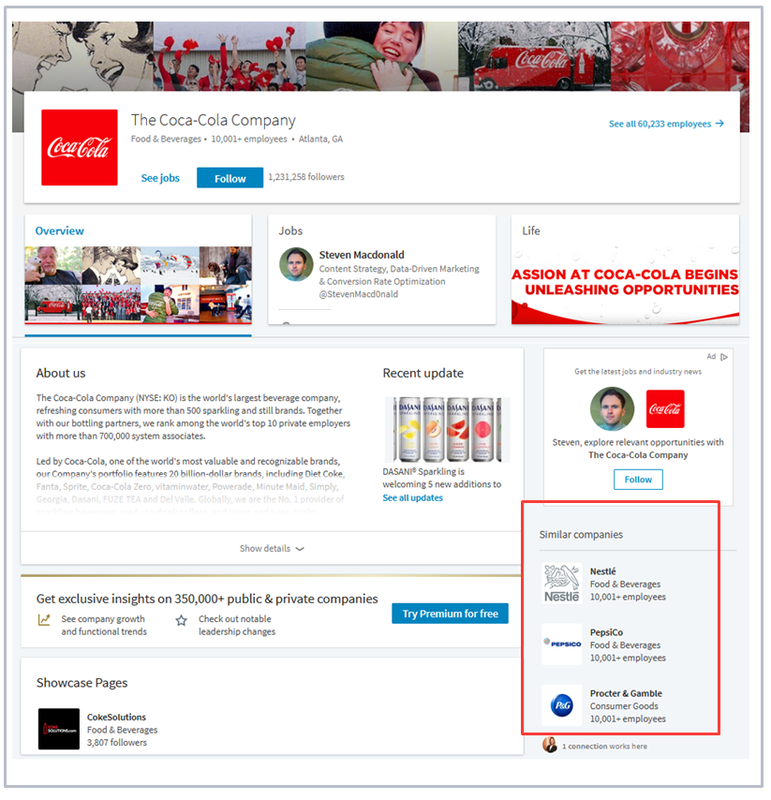 Once you have a list of companies (it doesn’t need to be an exhaustive list), you can use the same social selling strategies you’re currently using on LinkedIn to search for their profile pages and find then “similar companies”, as shown below. LinkedIn’s algorithm recommends similar companies based on company size, industry, company type and specialties. This allows you to identify companies that may match your ideal customer profile in minutes. Now, there might be some companies on LinkedIn that do not match your ideal customer profile, which is why the next step is to conduct research for each of the “similar” accounts you find. Unlike research for personas, ABM is not about targeting individuals (just yet). Account-based marketing requires account-based research! So, what information do you need to collect as part of your research phase? In most cases, this information will be publicly available and can be found on the company website, in press releases or annual reports. One of the most important aspects during the research phase is to identify and get access to key decision makers. 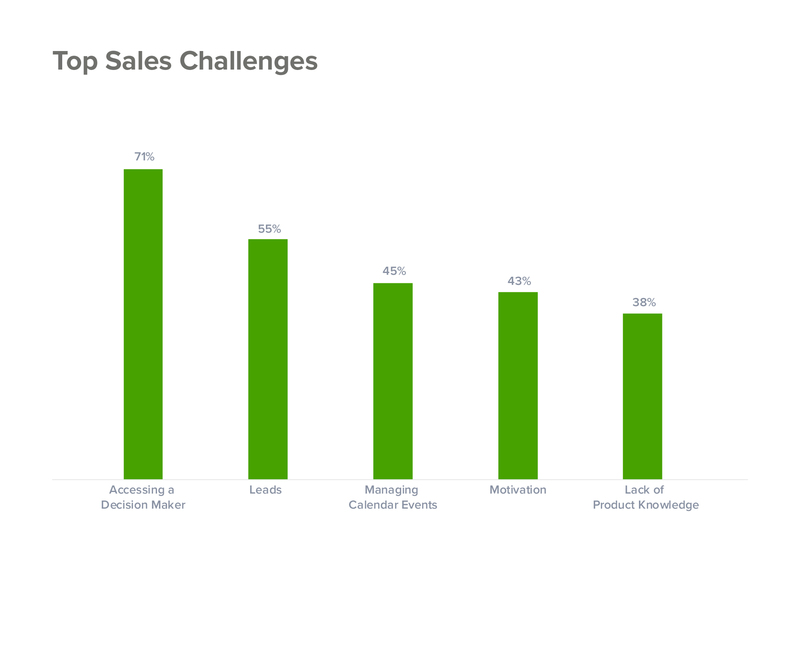 But it also happens to be the biggest challenge for sales teams! The earlier you can identify key decision makers and pass their contact information onto sales, the more successful your ABM campaign will be. Although, that’s easier said than done. It used to be that the buying power was a team of 1 (or max. 2), but today the number of people involved in making a decision is growing. For example, research from Gartner found that in a typical firm with 100-500 employees, an average of 7-8 people that are involved in the buying decisions. That’s a lot of people you need to convince. The good news is you can convince them all through content. Can you guess what kind of content engages B2B buyers? It’s personalized and relevant content. The more personal and relevant the content is, the more likely a buyer is to engage with you. And in terms of most effective ABM tactics, personalized content ranks number one! So, how do you personalize content and make it relevant? Well, the length that you go to to make the content relevant is entirely up to you. For example, the most common approach in ABM for B2B marketers is to create content that is tailored to a specific industry, but you can also tailor content to specific roles or accounts. But, before you create any new content, start by reviewing your existing content. Catalogue blog posts, case studies, white papers, and e-books and consider how they might be relevant for your ideal target customer. For example, if your ideal target account is a midsize IT company with 50 employees, browse through your website to see how many case studies you have that fit this profile. Ask yourself, are these case studies still relevant? And how can you help IT companies find this content more easily? Another example could be to check your CRM for IT companies to see how many went into a sales process that had started their journey with a content download on your website. Is this content up to date? Can you improve this piece of content to be more specific to your ideal target customer? Both of these tactics can help you get up and running quickly with an ABM campaign. However, if you have no content that resonates with your ideal customer, then the best way to understand their top business challenges is to interview existing customers that match their profile. This kind of voice of customer feedback is extremely powerful. Surprisingly, only 42% of marketers have conversations with their customers as part of their content research phase. Without interviewing existing customers, the content you create might not be relevant – and irrelevant content is the number one reason why buyers don’t engage with brands. What caused you to look for a new solution? How do you shortlist vendors? How do IT companies benefit from [your product niche] software? The reason to create content based on the customer journey is because you will need more than one piece of content to build a successful ABM campaign. Having relevant content that moves a buyer from one stage to the next is critical not only for lead nurturing, but also in terms of influencing the buyer on which vendor to choose. For example, 67% of B2B buyers say that relevant communication, provided by both sales and marketing organizations, was a key influence in choosing that company. As for lead nurturing, Forrester Research found that companies that nurture leads make 50% more sales at a cost 33% less than non-nurtured leads. Once you have your content ready, it’s time to promote it. The goal for any piece of content in your ABM campaign is to reach the right person at the right account, so you can engage, nurture and build on that relationship. So, what’s the most effective way to distribute content to reach the right person? That’s right – the good old-fashioned email. Providing you have permission to send campaigns, you can use email to send highly relevant content to either a single contact at an account, to a group of people within the account or to a handful of companies that fit your ideal customer profile. But email is not just limited to marketers. Sales reps can use email too! Unsolicited emails are perfectly fine as long as a legitimate interest has been established. Best of all, cold sales emails still work incredibly well. So, don’t declare email marketing is dead just yet! Other distribution channels include include IP-tracking and retargeting, paid social advertising and retargeting through the Google and Facebook ad platforms. But if you want to try something really different, then another distribution channel is direct mail (yes, I said it!). With direct mail, you can target specific people within a specific account and tailor the content just for them. Whether you print out an article, a white paper or a magazine, direct mail allows you to tailor that piece of content to include personal details such as company logo, names and job titles. Your ABM campaign is live; now it’s time to see how it performed. In the past, a successful campaign typically meant a high volume of visits or business leads. But, that’s really not the case with account-based marketing. The goal of ABM is to build and nurture relationships you have within your target account and move them from one stage to the next. And in some cases, this could take months, or even years! For this reason, traditional metrics like number of leads, website conversion rate, click-through rate and cost-per-click (CPC) are not part of measuring the success of account-based marketing campaigns. So, what does ABM success look like? To determine success, you will need to look at broader metrics such as awareness, engagement, relationships and ROI. To measure awareness within your target account, you can report on website visits, social media mentions, social shares and/or email responses (if you have an existing relationship). To measure engagement, you can report on website behavior including page visits, number of return visits, time spent on site and email permissions from your target account. To measure relationships, you can report on number of decision makers reached, content downloads and product trials or sign-ups. In addition, you will want to report on the overall campaign’s success – especially if you still need to convince senior management of your ABM initiatives. To measure campaign success, look at sales cycle length, deal size and total revenue from any new sale that resulted from your ABM campaign, and then compare these figures with the customers you acquired from your non-ABM activities. Another key success factor is ROI. How does the campaign spend and total revenue compare to traditional lead generation activities? Being able to show a high ROI, increased average deal size and total revenue is a sure-fire way to convince your company’s top management that ABM is the only way to generate new business in the future. Account-based marketing is nothing new. Highly targeted sales and marketing campaigns have always performed better than generic, non-targeted campaigns. However, it does require a new way of thinking. As a marketer, you’re no longer tracking volume of impressions or the number of website visits and leads. Instead, you will be tracking activities and engagement from single digit accounts. Does this mean that vanity metrics will go down? Most likely. Will revenue numbers go up? Most definitely! When you send out a B2B email marketing campaign, it will not lead to a surge in content downloads or free trial sign-ups. It may only lead to one download or sign-up. But, if it’s the right sign up, then that’s what matters most. And that’s the essence of account-based marketing. Like this article? You can share it with your network here. To learn more about how use existing customer data inside SuperOffice CRM for your account-based marketing strategy, then by sign up to a personalized demo below.